Otitis externa is an infection of the external ear, a common condition that is mainly seen in primary care. It is more common in younger ages and females, with a prevalence of around 1%. The incidence tends to be higher in hot and humid climates, and towards the end of summer. In this article, we shall look at the causes, clinical features and management of otitis externa. 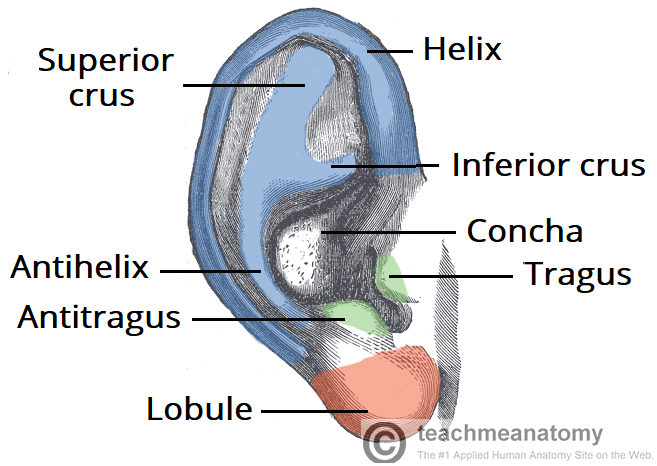 Otitis externa typically affects the external auditory canal – the part of the ear via which sound waves travel to reach the tympanic membrane. Any interruption in wax formation (e.g. repeated water exposure), trauma to the canal (e.g. cotton buds) or blockage (e.g. debris) can disrupt the external auditory canal’s protective mechanisms, and lead to pathogen overgrowth and inflammation. The skin becomes erythematous, swollen, tender, and warm, leading to debris and discharge accumulation. The narrowing of the canal, in combination with the accumulation of debris, leads to further entrapment of pathogens and propagating the infective process. The most common causative pathogens are Pseudomonas Aeruginosa (around 40%), S. Epidermidis, S. Aureus, and anaerobes. In rarer cases, it can be due to a fungal infection (typically Aspergillus spp.). Patients predisposed to developing infections (e.g. immunocompromised or diabetics) are at increased risk of otitis externa. They are also at a higher risk of complications (such as malignant otitis externa), therefore extra care must be taken when treating these individuals. The classical clinical picture of otitis externa is progressive ear pain with a purulent discharge (Fig. 2), alongside itchiness or ear fullness. Less common symptoms include hearing loss, tinnitus, or describing a swollen ear. Ensure to enquire about potential precipitants or risk factors for otitis externa. Otitis media with perforation – usually clear discharge or bloody followed by relief of pain, with an inflamed tympanic membrane with perforation. Ramsay Hunt syndrome – may present with symptoms of otitis externa, yet has evidence of vesicular eruptions within 2 days of first onset of pain. Furuncle – a painful ear canal due to localised abscess formation from infection of the hair follicle in the lateral third of ear canal. A visible bulge is present when examining with an otoscope. Less common conditions include ear canal malignancy, branchial cyst, atopic dermatitis, and exostosis. Otitis externa is usually a clinical diagnosis, based on a thorough history and examination of the ear using an otoscope. If otitis externa is not resolving with antibiotics or there are signs of fungal disease on otoscopy, swabs of the discharge can be sent for culture. In recurrent disease, it may be useful to check glucose levels for diabetes mellitus. As discussed later, any complicated cases of otitis externa may warrant a High Resolution CT (HRCT) scan to investigate the extent of the disease. Grade IV The tympanic membrane is obscured, perichondritis and pinna cellulitis, and signs of systemic involvement. The mainstay of management in otitis externa involves prevention, aural toileting, topical antibiotics, and simple analgesia. No single topical antibiotic regime has been found to be superior*, thus the antibiotic choice depends on the patient and doctor preference, local sensitivities and adverse reactions. Steroid drops have been shown to be beneficial when there is evidence of canal inflammation. It acts to decrease the swelling (allowing the antibiotic to perforate) and reduce pain. Any debris present should be removed by microsuction. The patient should be advised to avoid exacerbating factors, such as swimming. 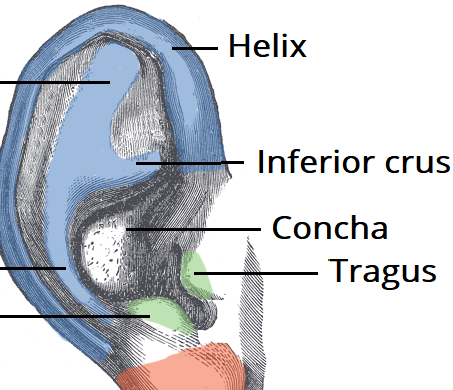 If using a standard hearing aid, they should consider a bone-anchored hearing aid (BAHA) instead. Any underlying eczema or polyps should be managed appropriately. Otitis externa usually resolves with topical antibiotics. However, in cases of delayed presentation, resistant organism or immunocompromised patient, it may extend to a more severe infection. 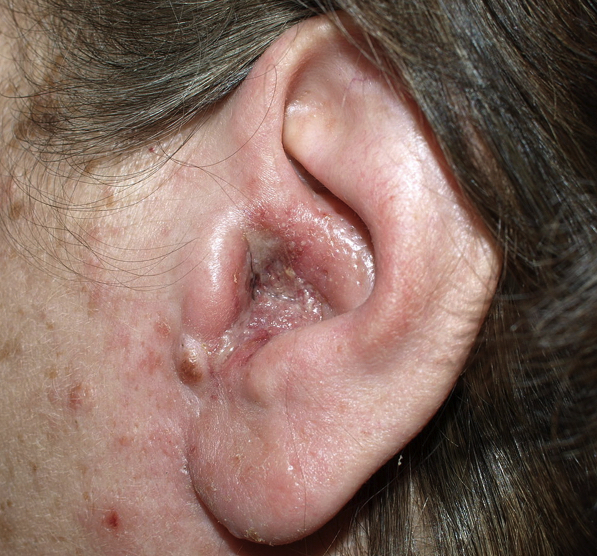 When the infection is longstanding, the patient develops complications, or has symptoms suggesting middle/inner ear involvement, referral to an ENT specialist is required. Potential complications of otitis externa include malignant otitis externa, mastoiditis, osteomyelitis, and intracranial spread. Malignant otitis externa is an extension of OE into the mastoid and temporal bones. It typically occurs in the elderly diabetics (or immunocompromised), presents with severe pain and headaches, requiring an urgent CT scan. It can cause CN VII involvement and requires urgent debridement with IV antibiotics. The most common causative pathogens of Otitis Externa is? What grading scheme can be used to quantify the severity of Otitis Externa?